Get a good taste of Bali and a mix of culture, romance, relaxation, adventure and of course flavorful food with this two week itinerary. Week one we spent using Ubud as our home base. Campuhan Ridge Walk.Ubud, Bali. Photo credit @sutarahady, www.sutarahady.com . We are finally settling back in at home and working through the honeymoon hangover (yes-it’s real). 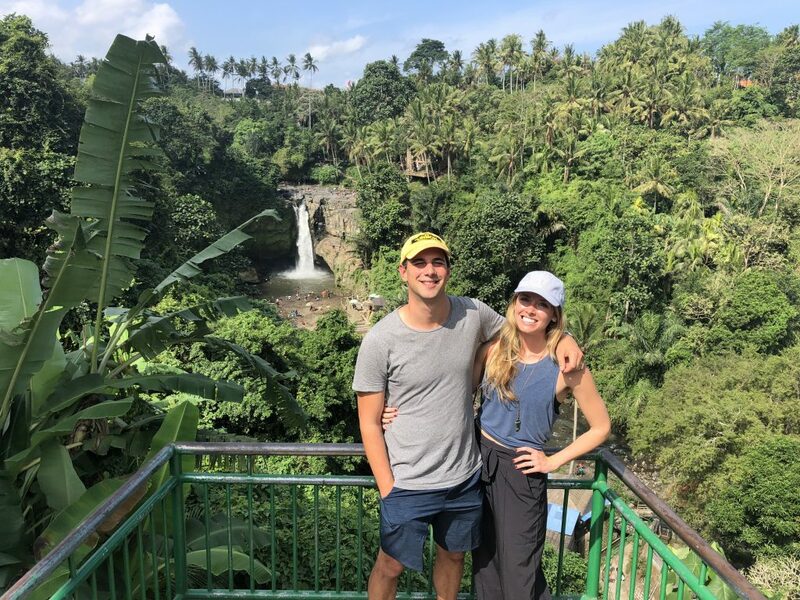 We LOVED honeymooning in Bali so we couldn’t wait to share our recommendations. 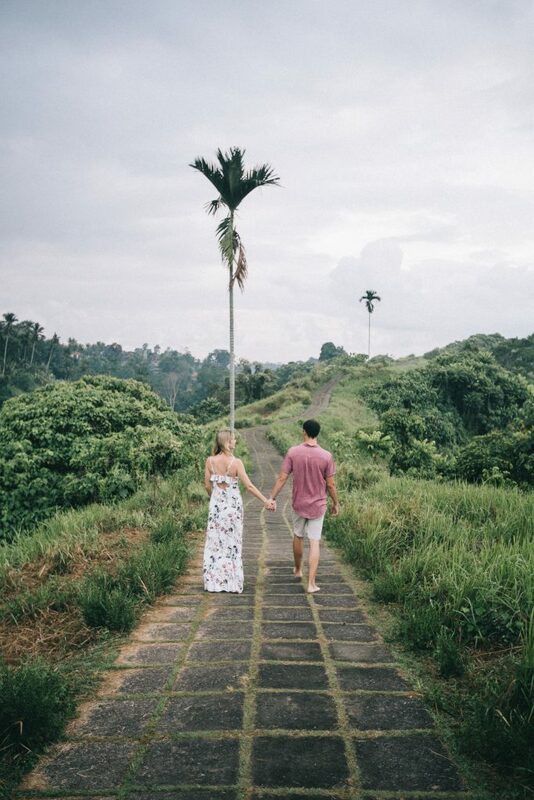 Bali wasn’t our first or even our second choice for our honeymoon initially, but we can’t recommend it enough now to others looking for honeymoon inspiration (or a romantic getaway) where they can do ALL the things on a post wedding budget. A big thank you to our family and friends from far and wide who gave us gifts so we could have such a carefree and beautiful time together as newlyweds. Get right out of Seminyak/Kuta and up to Ubud. If you don’t really want to feel or even know that you are in Bali then maybe Seminyak and Kuta are a great place to be for you. We only briefly passed through and while there is a mecca of restaurants and shopping and you can visit beaches it honestly felt like the vegas of Bali. We are not vegas people. Maybe you are? That’s okay, but this itinerary may not be a dream come true for you then. 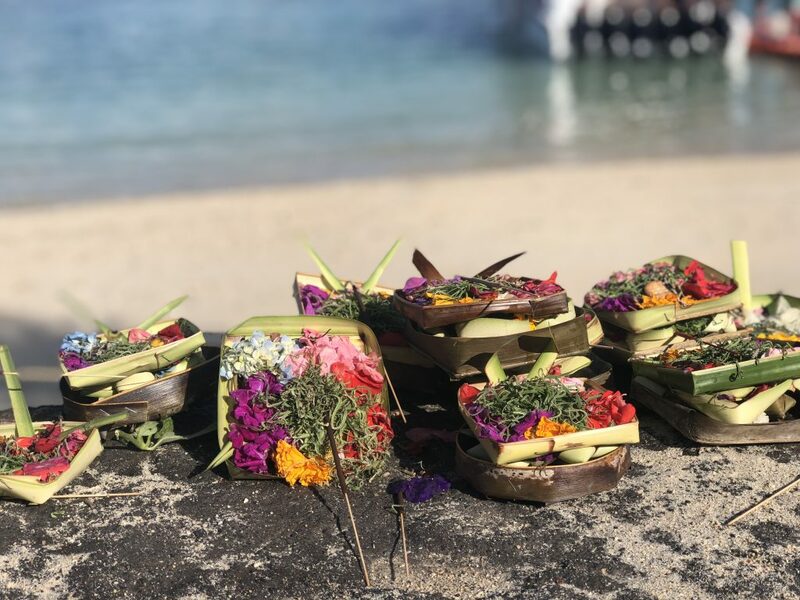 About $200,000 Rupiah ($20 AUS or $13.50 US) should be able to get you from the airport to Ubud, this is a typical price that you can prearrange with your accommodation before arriving. Just relax and settle in your first afternoon in Ubud. Maybe make plans to go walk around the city and have dinner or arrange to have dinner in your villa in private. 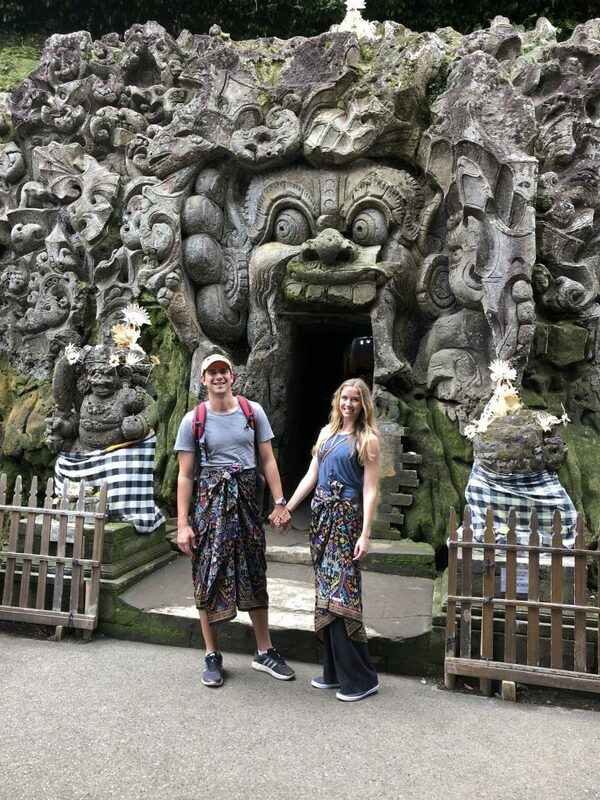 While Ubud has become very busy, it still has it’s own unique vibe and an even mix of locals going about their normal lives shoulder to shoulder with the expats doing yoga teacher training and families and couples looking to soak all the jungle and rice paddy temple vibes in. We did not scooter in Ubud. We opted mostly for private drivers arranged through our villa. Why? It just seemed more stressful then fun to scooter here. You should be able to rent a scooter for about 70,000 a day ($7 AUS or $4 US) and PLENTY of people do. Cost of a private driver depends on how long you want them for and/or where you are going. A private driver vs taxis means you get a consistent and usually fair price (no bartering required for the bartering opposed). Short trips cost around 50,000 (from our neighboring villa locations into the city center) and for an entire day of touring around and multiple stops we paid 700,000 Rupiah ($70 AUS or $47 US). A good estimate for a day trip hire is somewhere from 600,000-800,000 Rupiah likely. The choice is completely yours. The locals get up EARLY to do their market shop (seriously they are in and out before the sun is up and you have even gained consciousness to consider the daily debate of fresh mango vs papaya in your breakfast juice). If you want to join them and see more of the food, fish and real life hustle simply plan for an afternoon nap. The markets are less busy earlier in the day for the tourist markets (great market shopping for gifts or kitchen and house ware stuff, clothes, art etc) but going at the end of the day may provide you with some better deals. You don’t have to barter, but it’s pretty expected by all parties involved that there will be some back and forth. Check out 5 Tips for Your Best Shopping Trip to the Ubud Markets for more on how to navigate the market scene. If you happen to come across a steal of a deal on a mortar and pestle…….we’ll take your extra. Because when else would you, or could you, afford a several hour long pampering session. If your partner is open to trying new things book yourselves in for a couples spa treatment. 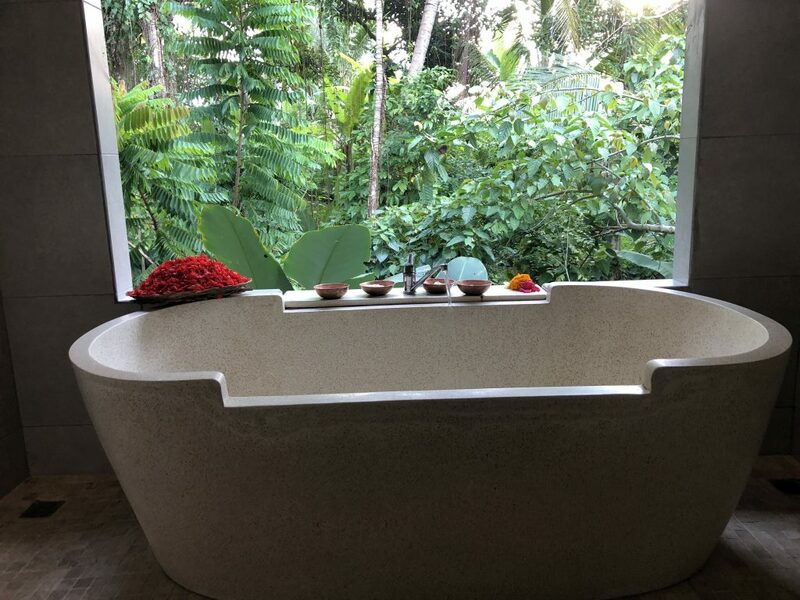 There are a large variety of places you could go, but after some research and reviewing recommendations we had been given I ended up booking the “Couples Indulgence: Spa Escape for Two” at Bali Botanic Spa. 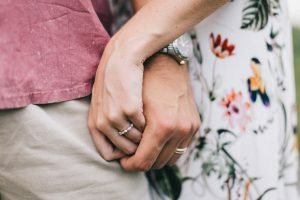 Couples massage, choice of body scrub, body mask, a private tropical flower filled giant bath and herbal tea followed by choice of manicure or pedicure THEN a multi course dinner for two at The Bridges Cafe. Professional, clean and boy did we feel pampered and R-elaxed. The cost? 1,350,000 Rupiah = $125 AUS or $90 US dollars per person. I opted to add on a facial instead of having a manicure or pedicure. Bogs was fine with everything…..except the manicure….despite me telling him he could skip it….he proceeded while I was off having my facial. After all this you are delivered to the Bridges Café for a three course dinner. We were pretty wiped by the time we got to dinner so while it was delicious and a beautiful place for a nice meal we definitely struggled to maintain consciousness. I would recommend booking in for a daytime/morning treatment or if you don’t do a spa treatment consider going for a romantic breakfast, lunch or dinner all the same. There is no shortage of availability and visibility of dance show tickets for sale in the city center. Not all dance troops are of the same caliber. Think of it like a sports team, there is the A team…then there is the B team…and well the C team too. While I suspect we weren’t watching the A team we really enjoyed the show we ended up at. It was captivating and so different from anything else either of us had been exposed to before. We only left wishing we could have known and understood more about the story behind the dance. Doing some research before on your own, or if you have a guide, would let you enjoy the performance even more. Performance pamphlets only give a basic overview and since I married a history lover…..that just didn’t quite feed the appetite for knowledge. We went to see the Kekac Fire Dance performed by the only female dance troop. We learned later that this dance is traditionally an all male dance which is what made the performance we attended so unique (although the guy scooting around on the ground on top of burning coconut husks at the end felt pretty unique enough). We didn’t really spend any time researching dance troops or performance dates so if you want to make sure you are in for a top dance troop performance you may want to do so and plan ahead. If not-there are a variety of shows almost every night. 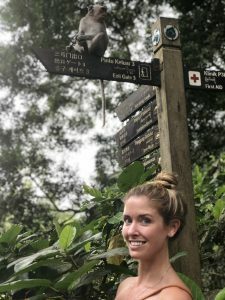 I recommend staying in a place that lets you wake up and enjoy the lush feel and sounds of the jungle and another that lets you enjoy the quiet calm and uniqueness of the rice terraces. This is what we did, staying just outside the city. We used airbnb to book all of our accommodations. This does mean you need rides into the city center or need to be willing to rent and drive your own bike (cheaper option). 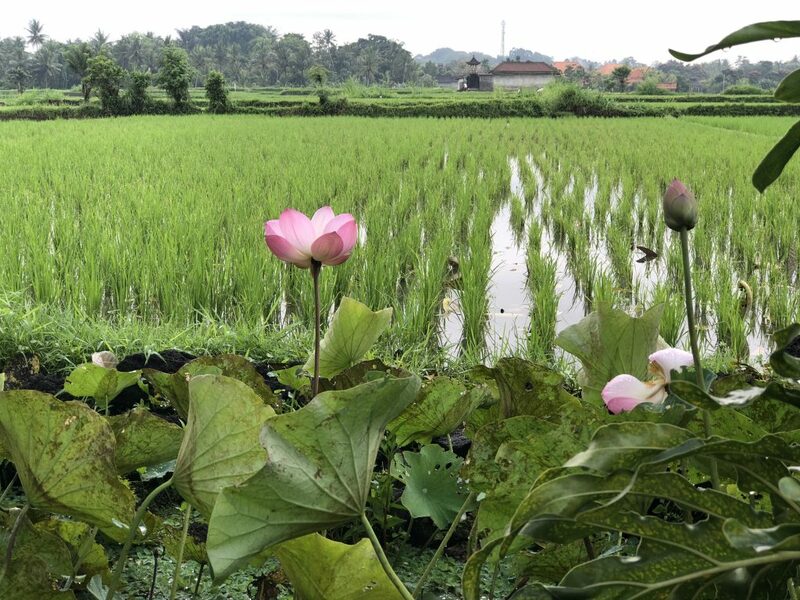 We liked staying in villages just outside of Ubud despite the minor commute because we felt like we saw more local life and “business as usual” and in different ways because of the changes in location and landscape. Get a couples in villa Balinese massage and then schedule another one. We booked all our accommodations through Airbnb, but if you are staying at any villa or hotel etc. the manager or staff should be able to arrange this for you (ours did). We paid 300,000 RPE for 60 minute long couples massage session. This is the equivalent to about $30 Australian dollars or $20 US. When you eat out there is a very small tax and tip included on the bill, but we still tipped on services like massage, when we had a private driver and the staff at our villas. It’s your choice if you do or not but when giving a 20% for a good massage like you would at home equates to $4….. in our opinion we preferred to be generous when we could. If you are able to have meals cooked for you in your villa do it and ask for Balinese food or dishes that would normally be eaten at home. You will still get a fancier version than what is actualy typically eaten and with much more variety of dishes served most likely, but the food is some of the best we had when this was available to us. I have been to Bali twice now and the families that care for the villas make the most flavorful dishes. Eat all the Tempeh. 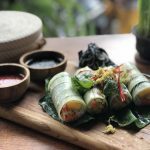 Tempeh in Bali is the best I have ever ever eaten and once you try it (preferably with peanut satay sauce……I think you too will daydreaming about it). Bogs is even converted. 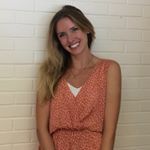 There are some beautiful waterfalls, and yes …..thanks to Instagram and blogs many many other people also know about them and want to check them out. They are still beautiful, make for great pics and a refreshing dip. Be prepared to pay for a storage locker at the larger falls for your things (if you bring things you don’t want to leave lying around). Have cash on hand in smaller bills so you can pay entrance fees and maybe get a snack or coconut which you might want. There will typically be at least a small set up with the basics (bottled water, pringles or other chips, maybe an ice cream bar, fresh coconut, maybe some other food-most likely French fries). Early is a good time to go if you can and prefer less of a crowd. You won’t necessarily need sneakers to make your way down and back up from the falls, but wear something comfy that you don’t mind getting wet/muddy/dusty (flip flops or sandals are great). Pack your own water, snacks and a towel if you can. We connected with the amazing Gusti (driver and tour guide and general all around just joyful wonderful man I had been fortunate enough to get to know on my previous trip). Him and his nephew (guide in training) took us around for a day of checking out temples and of course the picture perfect luscious green rice paddys. We walked around the Tegalang terraces which are full of swings you can pay to take pictures on but it was worthwhile to pay the a small donation to gain access and wander around and get close up to the actively tended and harvest terraces. Wear shoes you don’t mind getting muddy in and bug spray. We then headed to the water temple. 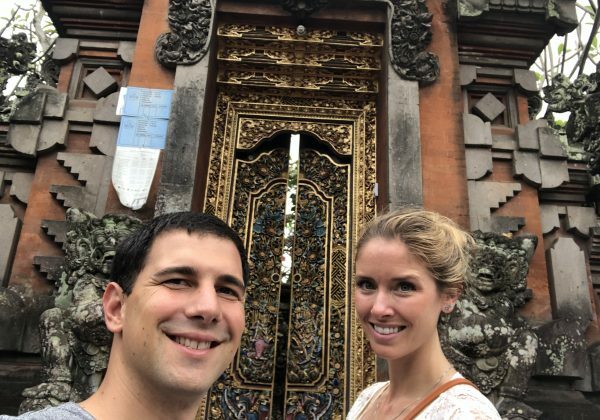 It was packed because there was a special ceremony going on, but this was actually great for us because we had a chance to see the temple being used by the Balinese people as it was created and intended for. We went to the elephant temple which is pretty incredible to consider how the heck it ended up where it is and while there go to observe the village making preperations for a ceremony. We ended with a dip in the Tegenungan waterfall which was pretty incredible as you hike down to the river bed and walk up to the falls. You pay a small entrance fee for all of the temples so plan to bring small bills with you. Your fee includes your ticket and a sarong which you cannot enter without wearing (no saraong for the waterfall, but still an entrance fee). Temple fees were around 20,000 Rupiah per person. Casa Luna was a lot of fun. 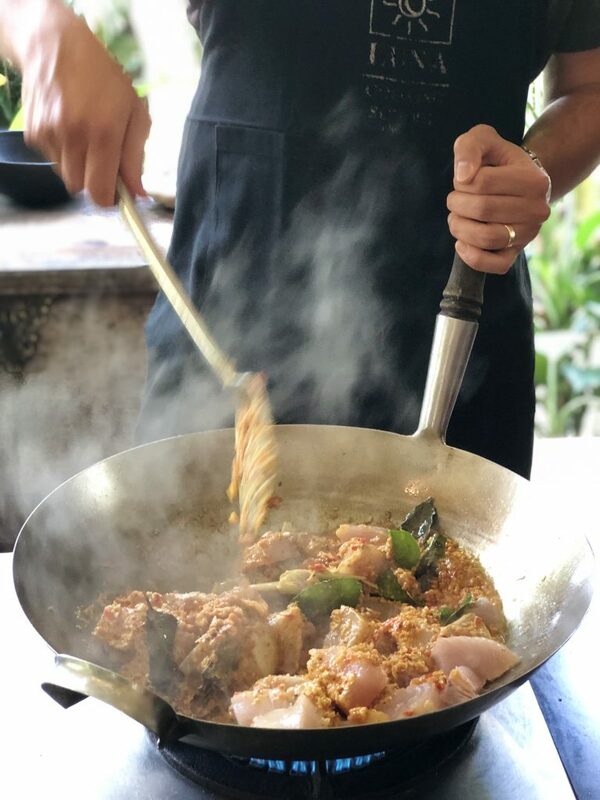 Book in advance-especially if you have limited time in Ubud and want to do something specific in the kitchen as different classes are offered each day. 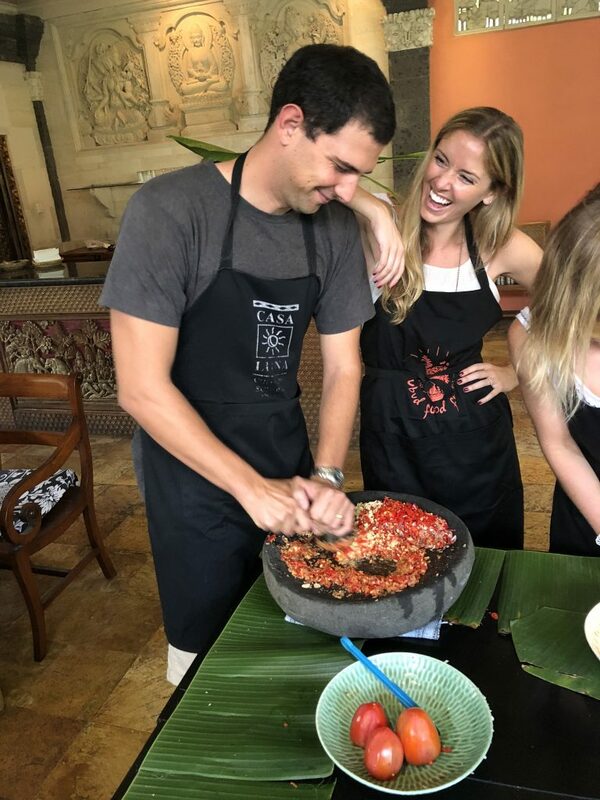 There are a lot of options for cooking classes and your villa can likely arrange one for you. I had fun doing this on the fly on my first trip to Bali, the instructor was funny, the food was great and we had a fun time. Casa Luna is beautiful though and in the heart of the city so it is easy to get to (down an ally though so give yourself time to find it). You can actually stay there, which after we visited we thought would have been a great idea. Our instructor was great. You are greeted with a delicious hibiscus tea and a nicely printed menu with notes about the ingredients you used which you get to take home with you (and for those nerds out there-raises hands-take notes during class). We make the hibiscus tea at home now and will enjoy it more as the hot Brisbane summer arrives and look forward to re-creating the banana leaf fish dish especially. 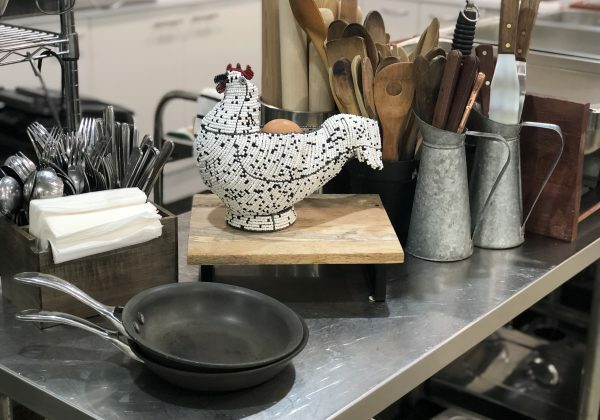 I learned more in this class than in my first on the fly random class-so if you care about taking away more than just the experience you may want to consider booking in with the cooking school. Plan for this to take up either your morning or evening. You can easily pair it with another activity if you are feeling up for it. Touristy? Yes, but worth going and so easy to get to there is no reason not to. Early in the morning is ideal if you want less crowds and less heat. You will be in direct sun so I don’t recommend going middle of the day or early afternoon on a particularly hot and clear day. Take a stroll in the lush greenness, bring a book and settle in at a café along the way with a juice and a snack in the shade or under a fan and just relax for a while. Although there are other travelers around you still get the sense of being out of the city despite being right on the edge. It is as beautiful as the photos look. The path is all paved and it’s not a very long or challenging walk. Pack water, bug spray, sunscreen and sunglasses. Ideal plan: take an early morning stroll for or just after sunrise then chill at nearby Lazy Cat Cafe (see Where and What to Eat below) and use the great wifi and delicious coffee to fuel scheming your next steps. 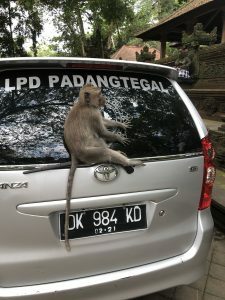 I didn’t go on my first trip to Ubud with two of my best friends because we were limited on time, but it also just looked super touristy which turned me off. On one of our “just exploring” walks around the city we walked by the edge of the forest (south Ubud). Getting glimpses of the baby monkeys goofing off on the edge of the forest boundaries sold me on wanting to see more. With such a leisurely stay in Ubud we thought why not! I didn’t realize how large it actually was. The opportunities to watch these goofballs is endless as you walk around the park and look at the temples. Grab a juice at the main entrance cafe to sip on while you scroll through your monkey photos and have a second round of laughing at each encounter. Do not bring in food or items that can be easily removed from your person. There are guidelines and warning at the entrance but seriously people…….have respect for the animals and their caregivers. 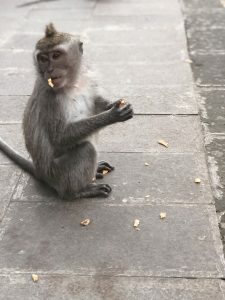 Luring a monkey in with chips so you can have an awesome boomerang shot for your insta is not only unhealthy for the monkey but it sets a precedent for them to potentially become aggressive in seeking food from people who aren’t their caregivers in the future. Just don’t. This is for you! We LOVE our photos and had a great time hanging out with our photographer. Several of our photos feature in this blog were taken by him in fact. Suta lives in Ubud and is Balinese-he is in the know on the best spots, time of day and in general just a great guy passionate about what he does. You can find him on Insta @sutarahady or his page www.sutarahady.com. We paid equivalent of $100 US for about 32 edited images (which we got to select ourselves from our shoot so they were our favorites). 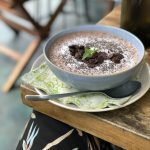 These are our top picks for places that were memorable to us (aside from the home cooked meals we had in our villa which were some of the most authentic and best Balinese dishes we had). There are plenty of tasty places to eat, but we would definitely go back to these ones. Make a booking if you are going for dinner-otherwise you might get lucky grabbing a bar stool (just as good if you don’t mind). Very close to the Monkey Temple/Forest so you could piggy back your monkey adventures with excellent food and drinks after here. Vegetarian options available. Try: Amazing food and cocktails. Everything we ordered was delicious. Steamed buns, fried chicken, Thai papaya and pomelo salad. Eat barefoot with a jungle view in this large spacious patio dining area. Focus on eco friendly and sustainable practices, vegetarian and vegan options available. Try: We went for dinner but I would check it out for breakfast. The giraffe salad (lots of yummy looking salads), hummus. Go here for a romantic date or fancier evening. 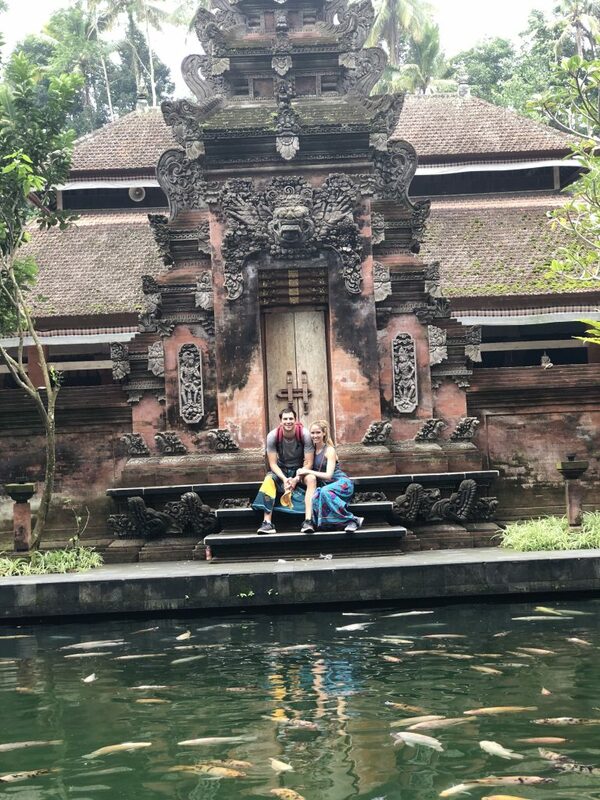 Sitting by the balcony edge with the lush jungle drop off surrounding you feels luxurious (and price wise, while it is expensive for Ubud and Bali, in comparison to other places…..you can REALLY go all in and treat yourselves in a way you might not otherwise back home). The food has creative flavor and texture combinations and beautiful visual presentation. Try: cocktails were excellent. Skip the bread at the start, share a few dishes so you can try more things. Leave room for desert! Right next to the Ridge walk this is a perfect place to end after your walk. High ceilings with a funky vibe from boho meets industrial furniture and artwork it feels like a secret cozy modern boho coffee lovers treehouse. 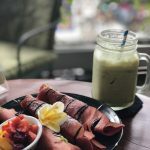 The coffee and matcha is excellent as well as all the food. We would have gone back more but we only discovered it at the end of our time in Ubud. So perch yourself up in a comfy chair and chill out for a while as you review your photos and plot your next moves. Vegetarian friendly, focus on local sourcing. Try: matcha, coffee and literally any and all food items. More tips for your trip? 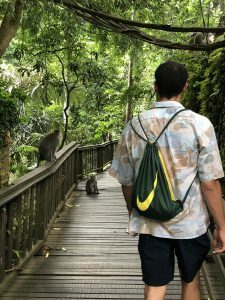 Check out 6 Must Pack Items for Your Bali Trip for the details on the things we were super thankful we packed and those we really wish we had.